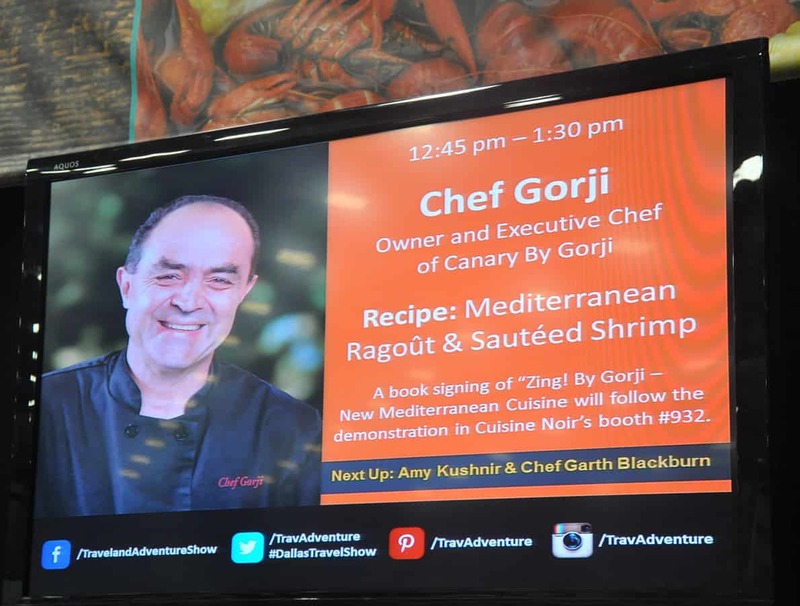 Chef Gorji » Blog » chef book signings » Travel & Adventure Show Dallas Features Chef Gorji’s Cookbook Zing! Travel & Adventure Show Dallas Features Chef Gorji’s Cookbook Zing! A book signing event featuring Zing! By Gorji — New Mediterranean Cuisine: Bold, Balanced, Simple & Savory follows the cooking demonstration. 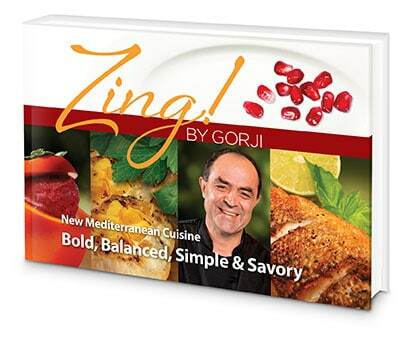 Dallas’ Chef Gorji, owner and chef of Canary By Gorji Restaurant, Gorji Gourmet Foods® and author of Zing! 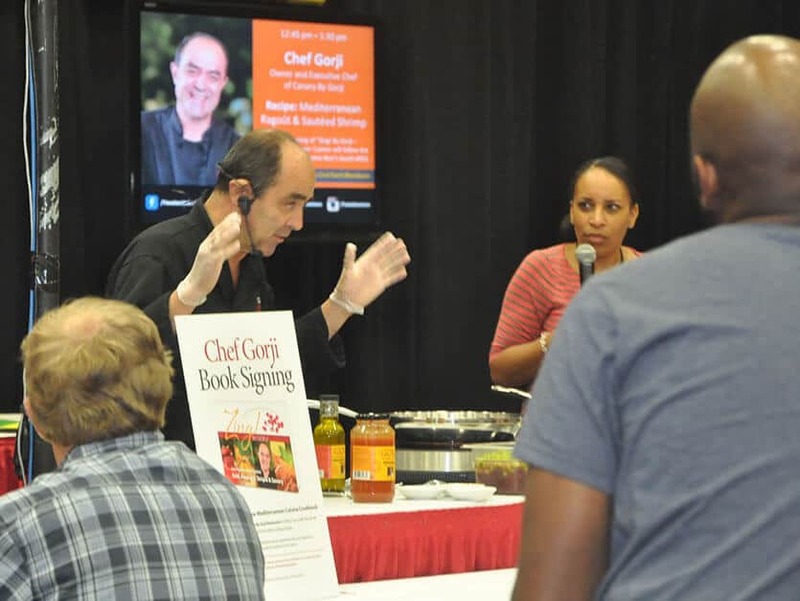 By Gorji cookbook joined national and local Travel and Adventure show chefs on the Taste of Travel stage held at the Dallas Market Hall, Sunday April 2, 2017. He prepared one of his New Mediterranean Cuisine dishes from his chef cookbook Zing! By Gorji. While attendees were tasting samples of the finished dish, he shared tips from his cookbook, Zing! and techniques that he uses in his upscale dining restaurant Canary By Gorji. Following the cooking demonstration he answered questions about his signature “New Mediterranean Cuisine” as well as signing attendees cookbooks. This was Chef Gorji’s second trip to the Taste of Travel Stage where he made a couple of his signature Pomegranate dishes. In 2014 he demonstrated Mediterranean Ragout & Shrimp from Zing! By Gorji Cookbook. At the 7th Annual Dallas Travel & Adventure Show travel lovers find travel inspiration, expert information and fun, cultural interactions. Because the convention hall is filled with exhibits, seminars and culinary demonstrations they can discover thousands of authentic travel experiences, could speak directly to the travel experts who could get them there, can get the inside scoop, and be introduced to exclusive travel deals. Furthermore, at the Taste of Travel Stage they can discover unique cultural flavors of local, regional, and worldwide cuisine. Meet featured celebrity travel speakers such as Jack Maxwell, Rick Steves, Samantha Brown and Peter Greenberg from your favorite travel channels. No Replies to "Travel & Adventure Show Dallas Features Chef Gorji's Cookbook Zing!"